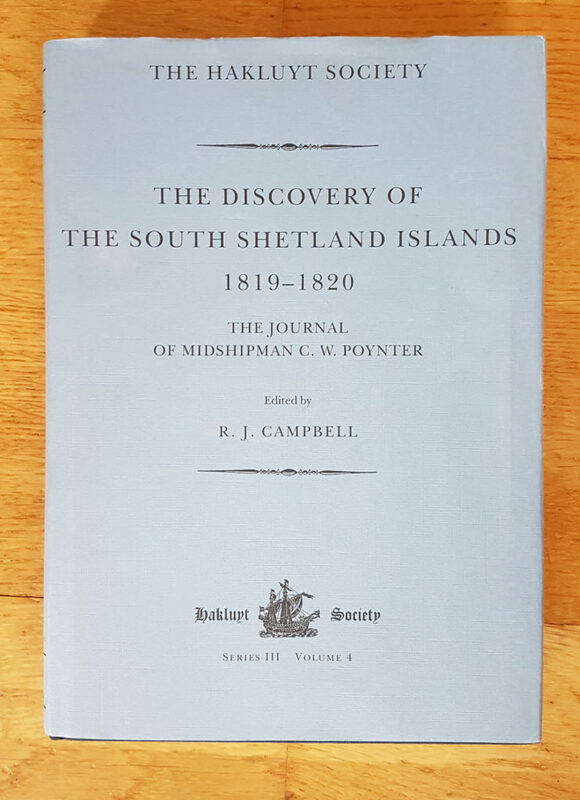 Edward Bransfield’s pioneering voyage of discovery of 1820 was the result of a chance encounter on the high seas almost a year earlier by Captain William Smith, a merchant seaman in command of the cargo ship, Williams. 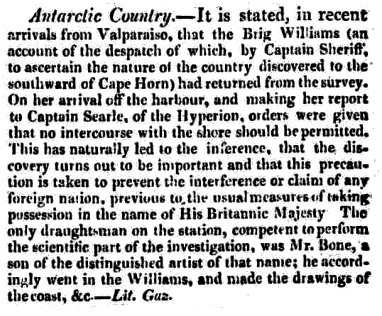 Smith was taking Williams around Cape Horn in February 1819 on a journey from Buenos Aires to Valparaiso, Chile. In search of more favourable winds to the south, Smith sighted uncharted land at latitude of 62° 15’ S.
In accordance with protocol, Smith reported his findings to Captain William Henry Shirreff, of HMS Andromache and the British naval station in Valparaiso, Chile. However, Captain Shirreff was not convinced and Smith was unable to locate the territory on his return to Montevideo a few months later. 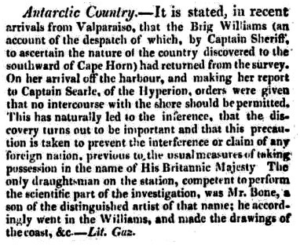 Smith was more fortunate on his third voyage around the Horn to Valparaiso and on 15th October 1819 the land was clearly visible. Two days later, Smith took a small party ashore and named the territory New South Britain. Today the land forms part of the chain of South Shetland Islands, a necklace of 11 major islands and numerous small ones stretching for close to 300 miles (482 kilometers). Smith was greeted with more enthusiasm when he docked at Valparaiso on 24th November 1819. Shirreff moved quickly, taking the Williams on charter and assembling a Royal Navy team to investigate Smith’s discovery. 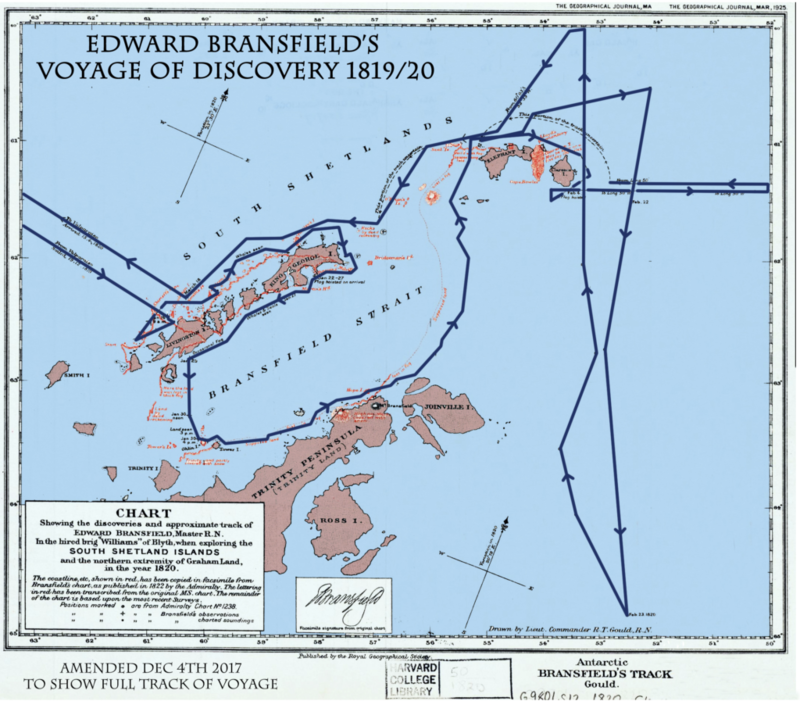 Edward Bransfield, a qualified ship’s Master with 16 years Royal Navy service, was appointed to lead the expedition. Bransfield’s instructions were to locate and map any new territories and to take possession for King George IV. He was also ordered to observe any wildlife and inhabitants. 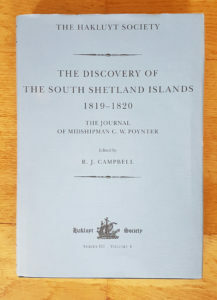 Finally Bransfield was ordered to “conceal every discovery that you have made during your voyage” and to keep a “secret journal” to hand over to Captain Shirreff on his return. The 2,000 mile (3218 Kilometre) journey from Valparaiso to the South Shetlands was fraught with danger for the small vessel which had not been strengthened against the ice and had sailed without a support ship in notoriously turbulent seas where cross currents and high winds are a constant threat. It took nine days to travel the first 6 miles (9.6 K) alone because of the poor conditions and banks of swirling fog closed in as Williams entered the fearsome waters of the Drake Passage. The first sight of land was made on 16th January 1820 as Bransfield ran along the South Shetland Islands seen by Smith a few months before. A small party went ashore on King George Island to formally claim the territory for Britain and Bransfield then turned south into the unknown seas. This deep stretch of water, which is about 60 miles (96 K) wide and 200 miles (321 K) long, is today known as the Bransfield Strait and separates the South Shetlands from the Antarctic Peninsula. This last statement is very powerful and shows they clearly understood the enormity of their discovery (unlike Bellingshausen) and it may be the first time anyone suggested they may have discovered the Southern Continent. Bransfield had discovered a rocky chunk of the north-western shore of the Antarctic Peninsula which was named Trinity Land. A small nearby island was called Tower Island and in the distance the party could clearly make out an imposing snow-capped mountain. The 2,500 ft peak is today named Mount Bransfield. The Williams was rocked by gales and very rough seas over the following weeks as Bransfield and his crew endeavoured to extend their new discoveries. 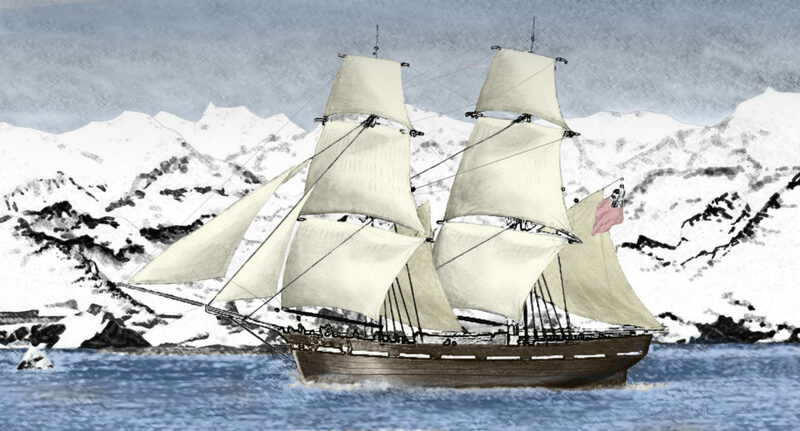 Occasionally, the ship broke into the Weddell Sea or ran along the eastern coast of the Peninsula and on 23th February 1820 the Williams reached 64° 56’ S. At one point, Williams steered close to Elephant Island where, a century later, Shackleton’s men would be marooned after the sinking his ship, Endurance. Bransfield turned north, (his decision partly made because his crew were dressed for Valparaiso weather and not the Antarctic weather for the whole trip! 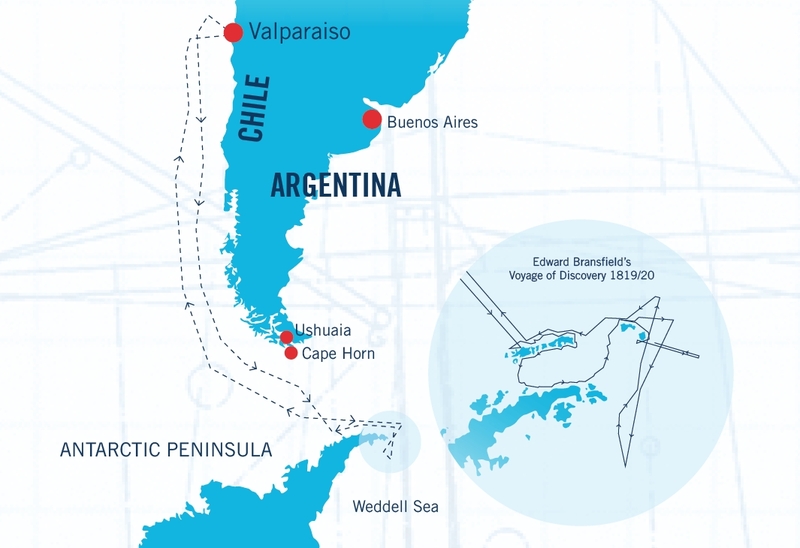 ), and re-entered Valparaiso on 14th April 1820 at the end of an epic and hugely challenging voyage. Not a single man was lost. 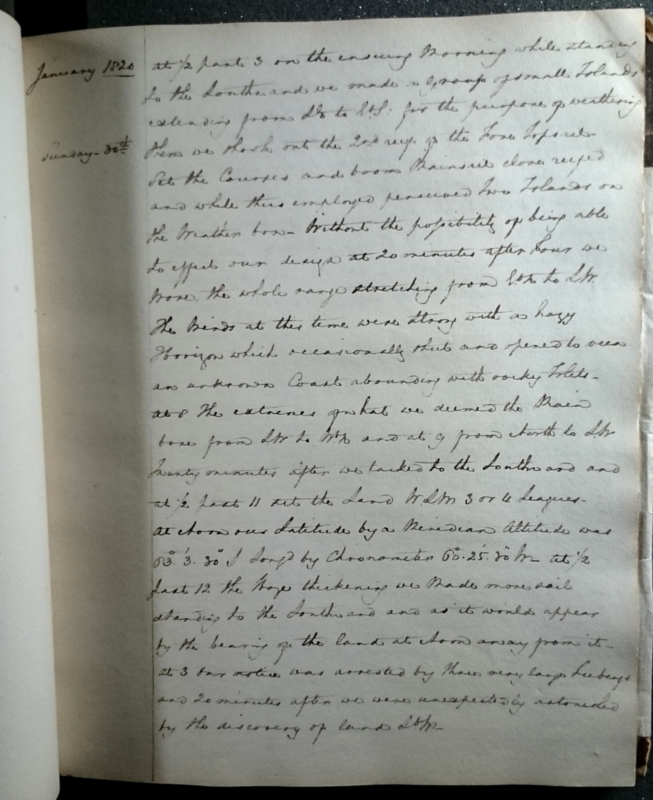 Few documents written by Edward Bransfield survive but one is a letter written by Edward Bransfield, dated 4th May 1820 in the Public Records Office of the Admiralty (London). 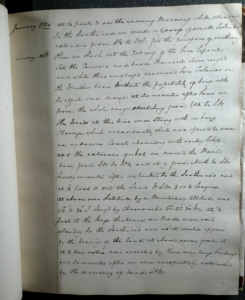 This letter proves he handed over his log book and charts and also asked to be allowed go back to finish his work. His request was never granted and his log book is now lost.